TRANSGENDER footballer Hannah Mouncey has vowed to fight on despite the latest AFL policy making it difficult for to her meet requirements. Mouncey tweeted 'Why quit now?' when asked for her response on social media on Friday night. The League released its long awaited 'gender diversity policy' and while the AFL wouldn't comment on Mouncey's personal data, it's understood she is unlikely to meet the requirements. 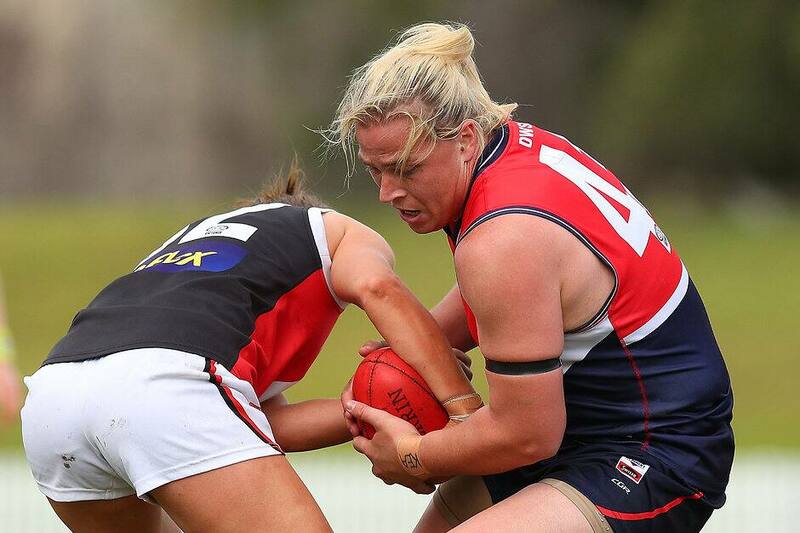 The 28-year-old, who was born male and played handball for Australia, has been playing VFLW for Darebin after the League blocked her from nominating for last year's draft altogether. Under Friday's ruling Mouncey could technically still go through the testing and nomination process, but the requirements are challenging. Given the physical nature of Australian Rules Football, it is considered that maintenance of testosterone at or below 5 nmol/Lfor at least two years is reasonable to ensure that the competitive advantage of higher levels of testosterone have dissipated to an acceptable degree at the time the trans or non-binary person proposes to play in the AFLW competition. This threshold requirement has been the subject of extensive medical consultation by the AFL. If the threshold requirement is met, trans women and non-binary people seeking to nominate for the AFLW Draft must produce information including (to the extent available) data regarding their height, weight, bench press, 20m sprint, vertical jump, GPS data and 2km run. "We know that inclusion and belonging delivers real social benefits for individuals and communities, and we do want to send a message that all are welcome in our game," AFL social inclusion general manager Tanya Hosch said in a statement released late Friday. "The policy will be reviewed at least every two years, and the AFL also acknowledges that the Australian Sports Commission and the Australian Human Rights Commission continue to develop a sporting industry wide approach."